Tahani is a six ring kid. The female Oryx-Boy came ten days ago in the Zurich Zoo to the world around stalking perk up in the enclosure. The gear is still a little awkward, his sand colored fur looks a little ruffled. Today it is out for the first Time. A name it already has: Tahani. Well, the sun is shining, because it must insert a Pause in the hay. Then mother Khalipo is quick to sniff it. But it is trying, in his half-sister Thuraya leap after. You do not succeed. This, however, is already three months old and already has a small squirrel. The two are Urururenkel of the first Arab Zürcher Oryx, which are involved in it, that there are these beautiful animals . Because they are with their long, straight horns and the gleaming white coat so beautiful, they were hunted in their original distribution area, the deserts of the Arabian Peninsula. Who shot an Oryx, was regarded as particularly male, came to the belief that the enjoyment of their flesh shooter from enemy bullets. 1972 was poached in Oman, the last free-living animal. fortunately, there was a zoo and the Tiergarten. In Phoenix (USA) has built up a small stock again, in 1979, the first animals to Europe came, in the animal Park Berlin, Antwerp and Zurich. "The six Zurich Oryx formed the basis of a successful breeding that continues to this day," said curator Robert Zingg today, as the youngest of the offspring was presented to the media. In the case of a reintroduction project in Zurich was able to give the animals to Jordan to Shamari reserve. Oryx are not only beautiful to look at, they are also adapted amazingly well to the difficult conditions of the desert. The light color reflects light and protects from the heat. Their feces is very dry, the urine is highly concentrated. The Most striking thing, however, is that the body temperature during the day rise to well over forty degrees, which would be in people dangerous fever life. The Oryx retains literally a cool head, because she has developed a System to cool the brain. Bock Orli seems to be, however, just to lose the cool head and to be properly heated. He flehmt. Means, he checks with the tip of the tongue of the pheromone content in the urine stream of a female, in order to determine whether this re-conception is ready. 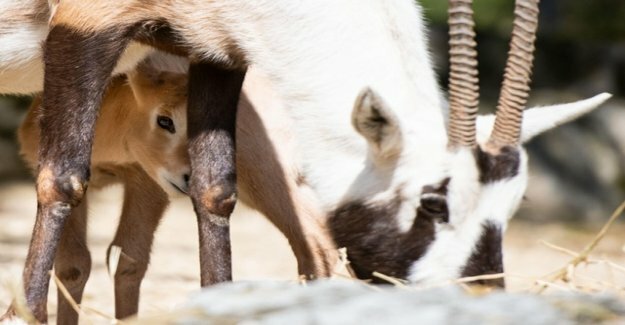 For further offspring in six Arabian Oryx in the Zurich zoo seems to be so taken care of. This is also necessary because of the large-scale reintroduction project suffered after the initial success of a setback.